Basic Rider Course 2 (BRC2) (Also known as Experienced Rider Course or ERC): Many of our sites also offer the BRC2, and we strongly recommend this course to anybody who has been riding for a little while. 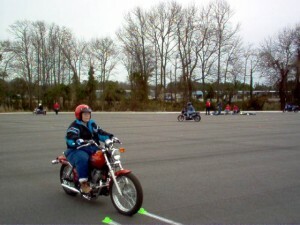 It’s a great way to learn more about your riding abilities, and the capabilities of your motorcycle. Students interested in attending an Basic Rider Course 2 (BRC2) must possess a valid motorcycle license or motorcycle endorsement to their license. A motorcycle learner’s permit is also acceptable. The same age and high school requirements cited above apply to the BRC2. It is recommended that you have at least 6 months riding experience or 3,000 miles under your belt. You must provide a street legal, properly licensed motorcycle for the range exercises, and must show proof of insurance. Your bike must also pass a visual safety inspection on the morning of the class. (3-Wheeled Motorcycles are not permitted). If you normally carry a passenger, you may take the ERC with your passenger on board.